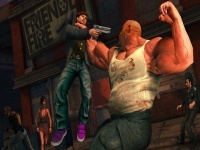 a few levels throughout the game to unlock certain higher-level abilities. Money is fairly easy to come by as well. Basically everything you do towards completing the game will give you cash, and you can also earn an hourly wage by taking over each ‘hood’. 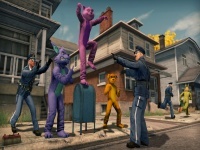 There are dozens of ‘hoods’ in Saints Row: The Third which make up four distinct regions on the map, owned by three distinct rival gangs. You can take over a hood by doing multiple things such as buying local businesses, completing side activities, and wiping out known gang locations. There are also plenty of cribs to purchase, where you can access cars from your garage, and then there are the larger cribs which are in penthouses of skyscrapers. These penthouses house helipads, and are sometimes upgradeable. One thing we noticed was the cribs are less upgradeable than previous games in the series. There are less than a handful of upgradeable cribs, and you only really make the building taller when you purchase the upgrade. This is great if you like base-jumping, or throwing hos off buildings, but otherwise fairly pointless. We’d like to see customisable cribs where you can change the couches, carpets, and size of the fridge. Homies need stock options too! What we felt the game lacked was innovation. Although we use the term over-the-top multiple times throughout this review, the game actually doesn’t really introduce anything amazing to the audience. Everything feels far too comfortable, and nothing makes the game stand out from any other title with a big budget. If they’re going to rip off dozens of other franchises, why not throw in a portal gun and show Valve ways they could use it in Portal 3? 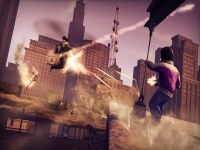 Or how about giving DICE a run for their money by providing some entertaining rooftop chases? Volition needed to take ideas and build on them, instead it felt like they just took ideas.